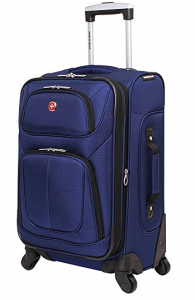 The Swiss Gear Carry On 21 inch has been designed with some of the best materials and features.  The suitcase really does look the part, it is similar to Samsonite Aspire Xlite Spinner 19 inch, in the sense that it comes in one color, looks sleek, stylish and professional. The removable zippered wet bag inside will allow you to store your wet swimwear in a pocket separate from the rest of your clothing. 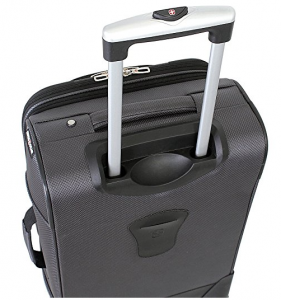 The suitcase has been made from high-density polyester fabric with a PVC backing, to increase durability. 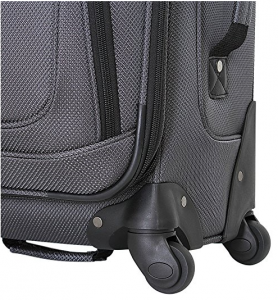 The spinner wheels this case possesses, have become a staple of modern-day luggage, and you would be surprised if a bag claiming to be one of the best in class not to have them. This ergonomically expandable luggage has been designed with strength, comfort, and function in mind. The Swiss Gear Carry On comes with two exterior pockets which allow you to store your travel essentials for easy access throughout your trip. No longer will you have to search through your suitcase to find your reading materials while waiting for the aircraft to depart. The expandable zipper will give you an extra couple of inches of storage capacity, just like the Samsonite Aspire Xlite Spinner 19 inch, you will be able to store more of what you need. It is a larger capacity than the Samsonite spinner, although you would expect that given it is a couple of inches taller. Inside the suitcase, you will find a detachable zippered wet bag. You do not need to worry about your wet clothing causing you to travel with a bag of slightly damp, smelly clothes at the other end of your trip. On one side of the interior, you will find a zip mesh lined pocket, allowing you to easily organize your loose items. On the other side, you will find the main compartment which will hold your clothing in place with the straps provided. The Swiss Gear Carry On is packed full of the features that you have come to expect in a modern soft sided carry on suitcase. 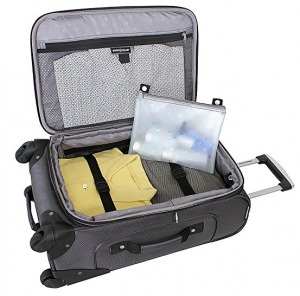 The suitcase is expandable, allowing you to store an extra few items in when needed. The four spinner wheels give you the ability to breeze through the airport without any struggle. The aluminum telescopic handle, locks into place, allowing you to push and pull whenever you desire. The interior zip mesh pockets allow for safely storing items along with an ID pocket for quick, easy access. There are two carry handles, one on the side, one on the top, allowing for easy lifting and storing away. The Swiss Gear Carry On 21 inch weighs in at a massive 8 lbs. If you thought that the Samsonite Xlite was heavy at 7.5 lbs, this is another 0.5 lbs on top. 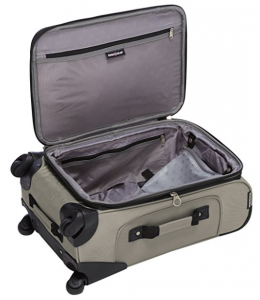 If you are cautious about the weight of your suitcase then there are many options available on the market today. The Kenneth Cole Reaction Out of Bounds 20 inch is a hard-sided suitcase and still weighs in close to 25% lighter than the SwissGear suitcase, I guess now you can really say that the weight gap between soft and hard-sided suitcases is no longer noticeable. Being a heavy 8 lbs could affect what you pack into it, especially if you are traveling with an airline carrier who imposes a weight restriction on cabin luggage. Made from high-density polyester fabric, Swiss Gear Carry On is scuff-resistant, so that your baggage will stay looking fresher for longer. The aluminum telescopic handle is solid and sturdy, unlike many others on the market today. The handles are solid, strong, and will instill confidence in you. In comparison to the Rockland Melbourne Luggage, it will be difficult to find a fault in the construction or durability of this suitcase. That being said, it is not as strong and protective as a hard-sided suitcase, a blow or knock could easily damage your contents inside. The Swissgear Suitcase does look stylish, sleek, and professional. Showcasing the SwissGear iconic badge, it is a suitcase that you will be proud to have as your travel companion. Coming in one color, however, can have its downsides. If you are looking for your luggage to stand out from the crowd, this is not one of them. If you leave it anywhere, it will quickly blend in with the hundreds of people and suitcases, making it harder to spot where you left it. It does look very professional and will not be out of place if you are wearing a suit and shoes, ready for that corporate meeting. 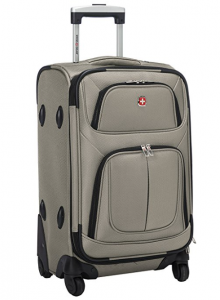 The Swiss Gear Carry On 21 inch measures at 22.5 x 14.5 x 10 inches, including the wheels and handles. As it is expandable, you will want to be cautious about how much you expand this suitcase for it to still fit in the overhead lockers. 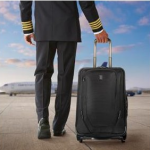 As with all carry-on suitcases, it is best to check with your airline carrier to ensure that it meets their requirements, in order to prevent disappointment at the airport. 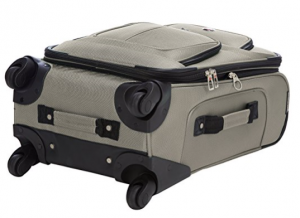 The Swiss Gear Carry On 21-inch suitcase comes with a 5-year limited manufacturer’s warranty. The warranty is standard compared to other manufacturers’ warranties, covering manufacturing and material defects. It does not cover wear and tear, although you will be hard pressed to find one that does. In comparison to the Samsonite Aspire Xlite suitcase comes with a 10-year warranty, double the amount of time, it may be something to consider if deciding between these two. 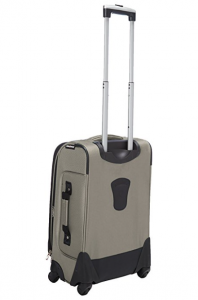 One of the best soft-sided small suitcases! 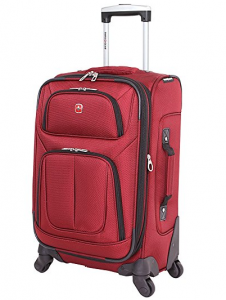 The Swiss Gear Carry On Sion 21” is one of the best soft-sided small suitcases that you can find on the market today. If you want a suitcase that is stylish, professional and will be a trusted travel companion for a long time, then it is an investment that is worth it.